For the second time this season Joel Farabee has been named Hockey East Rookie of the Week. The freshman wing scored twice—including the game-winner—in Friday’s win against Arizona State and now ranks second in scoring for the Terriers with 20 points. Patrick Harper, with three points in the 7-2 win against Merrimack, and Jake Oettinger, with 68 saves in the two wins, were named to the weekly list of top performers. - I thought BU played well in the first period, but as the game continued, ASU's strength and experience showed through. The most noticeable deficiency was not having anyone in the slot area to follow up on shots. I think ASU just out muscled us and we couldn't get to those areas. There were very few second opportunities. By the third period, we looked exhausted and it was just tough to generate any chances. 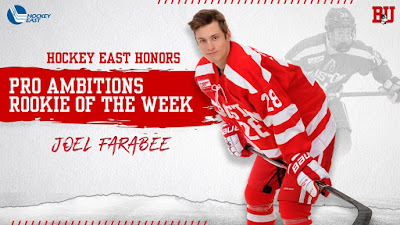 - Joel Farabee had a rough game in terms of decision making. The biggest example was making a drop pass to nobody (actually to two Sun Devils) when we had a virtual 3 on 1. I believe the play led to ASU's first goal. On the heels of two late penalties on Friday night, I think Farabee is likely going to be hearing some thoughts from the coaches. He is clearly a talented player and he is having a nice freshman season, but his youth is showing through against these older teams. - I thought Vinnie Purpura played well. He did give up some pretty juicy rebounds but his movement and positioning looked solid. The first two goals would have been tough to stop for anyone. The third was just a great play by ASU to get it on net quickly before he was able to cover the other post. - Jack DeBoer is looking better and faster than he did early on. However he took a very dumb penalty erasing what would have been a full power play to start the third period. Again, the youth factor. - I thought Dante Fabbro had a strong game. The more I see him this year, the more I realize that he may be one of the best all-around defensemen we have had at BU for some time, and we have certainly had some good ones. I can't see any way the Predators let him stay for his senior year. He might need a year in the AHL, but I think he has a very long NHL career ahead of him. A treat to watch. - Kudos to the ASU program for coming such a long way in such a short time. While their strategy to this point may have been to recruit older players with size, I have to think it won't be long before they start landing some USNDTP players, especially if they get into a conference. - Looking ahead, I think BU could actually look better against a team like UMass than against ASU, because of what they bring. I think this team can still make some noise down the stretch, but I imagine there is no route to the NCAAs other than winning the HE tournament at this point. USA Hockey profile of 2019 recruit Trevor Zegas, who scored a pair of goals in the U18s’ win against Muskegon and now has 53 points (15G, 38A) in 36 games. 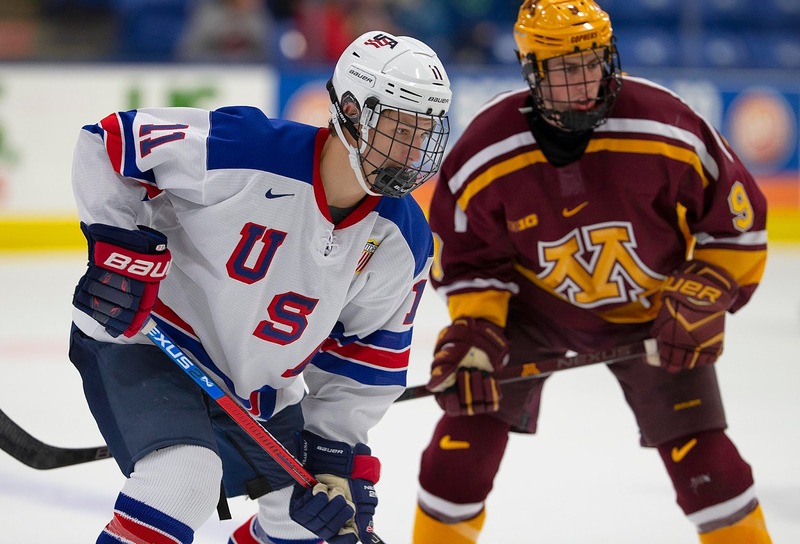 McKeen’s Hockey’s midseason rankings for the 2019 NHL Entry draft has Zegras at #10 and 2019 recruit Robert Mastrosimone at #31. 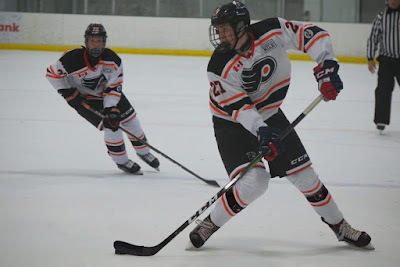 2021 recruit Roman Schmidt has been named to Ontario’s 16U team for Canada’s Winter Games. The 6’5” right-shot defenseman for Don Mills Flyers is ranked among the top prospects for the 2019 OHL draft. Evan Rodrigues scored a goal and assisted on the game winner in Buffalo’s 5-4 win against Columbus. Rodrigues has scored a goal in each of the last four games for the Sabres. Following a win and a tie against Merrimack, the Terriers moved up from #10 to #8 in the USCHO Weekly Poll. Sammy Davis (2G, 2A), Mackenna Parker (2G, A) and Kristin Schuler (3G) were named to Hockey East’s Weekly list of top performers.